The pink dwarf anthurium in a 5.5-inch (13.97cm) wide pot which was added to our tropical garden in September 2011 had outgrown its space and definitely need some attention from us. Hence I took the opportunity to do the needful, that is, dividing the whole clump into two sections and pot them separately as a means to propagate them. Also, a chance for me to share a how-to article about the propagation which is easily done. 1. Carefully remove the plant from its pot when the soil had become congested with roots. 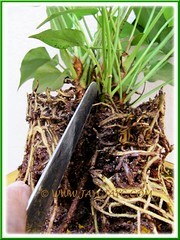 Then use a knife or something similar to divide the clump and gently shake away the excess soil from its roots. I’ve divided it into two sections as illustrated in the image above. 2. Prepare 2 pots, with new garden soil to replant each division. For this project, I’ve used two larger pot sizes, the larger is 10-inch (25.4-cm) while the other is 8.5-inch (21.6-cm). Keep in mind that the growing point should be above the soil. Water thoroughly through and add more soil if necessary. Then locate it at a semi-shaded warm site. 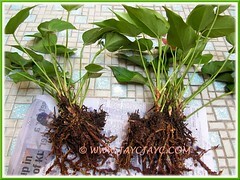 There’s another article on how to propagate Anthurium by stem cuttings here, if you’re interested. Basically – what I do is that I carefully shake off each plantlet off from the parent plant. Which somehow they detach very easily together with the roots. And they are easily replanted individually and they seemed to do quite well when planted with their own separate space. The only thing I had to watch out for is the sunburn on the leaves when it get too hot for them. And when they do not get enough sunlight – they fail to bloom. Thanks for dropping by and sharing your experience, James. I’ve noticed that the newer dwarf variety prefers semi-shade while the traditional ones with tall stems and aerial roots can somewhat tolerate full sunlight. Haha, I am like James. I use my hands to separate them. My anthuriums are like orchids, they like to let their roots take a breather. 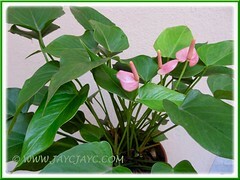 Yes, James’s and your alternative method is easily done as Anthuriums have shallow root system. Have a lovely Sunday and a great week ahead, my friend! I’m reading the article on Anthurium Propagation for the first time. I have an old plant that has been in the same pot for about 15 years or longer. As described in the beginning of the article, it has these long leggy branches and sparse leaves. At the moment there is only one bloom on the aged plant. At one time it was a very beautiful plant flushed with flowers. I’m going to attempt to revive it and propagate some new little ones in separate pots. My daughter has been wanting one of the plants for a long time. Hopefully I can surprise her with a propagated one from mine. I’ll write again and let you know if it was as easy as you have described in the article. I think my other article on how to propagate Anthurium by stem cuttings at https://www.jaycjayc.com/anthurium-propagation-cuttings/ is more suited for your aged plant with leggy stems.